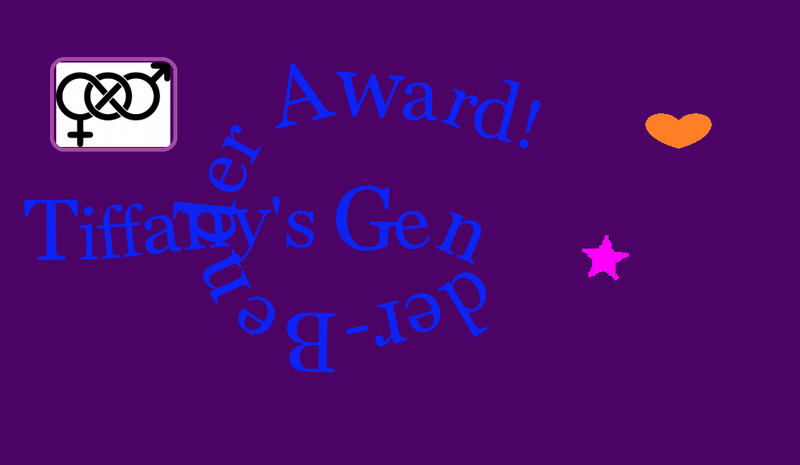 Tiffany’s Gender-Bender Award is an opportunity to celebrate those who challenge and disrupt the gender binary! Each month, I will feature a post that in some way takes us beyond the paradigm of gender oppression. Many types of content will be considered – poetry and prose, fiction and nonfiction, even visual art. I will also consider a variety of perspectives, everything from 1800s “first-wave” Western feminism to women’s uprisings in the Muslim world today, from Stonewall-era gay liberation to 21st century activism for transgender rights and dignity. This Month, I am awarding Trans* Jersey for “Non gender binary issues“. Trans* Jersey supports the proposal that gendered language in marriage ceremonies should be optional and that an X marker on passports and birth certificates should be introduced. Both these issues are most important for genderqueer, androgynous, bigender and intersex individuals. 20 May, 2014 in Uncategorized.